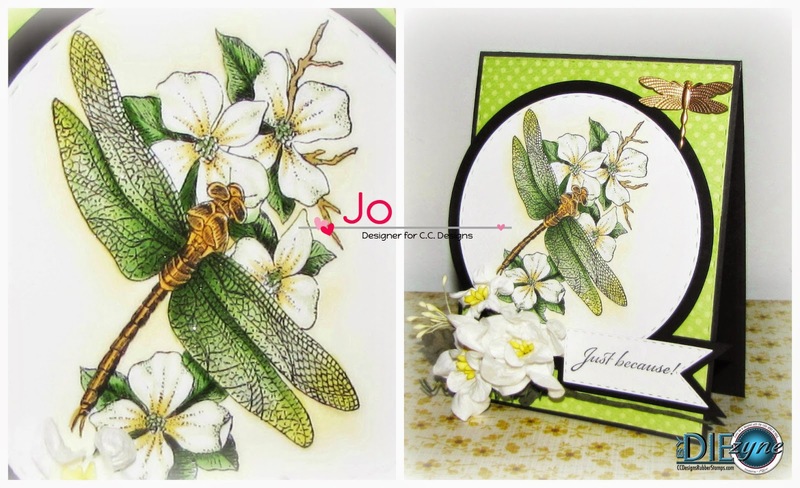 We have 8 new image stamps and a sentiment set from DoveArt and you are invited to our wonderful blog hop. These images are beautiful and make for some very elegant cards. Many of the images will be perfect for Mother's or Father's Day cards, which is right around the corner. We have an elegant, beautiful hop for you to enjoy today. The stamps are available for purchase now, you will want them all by the end of the hop. You can purchase the stamps here. 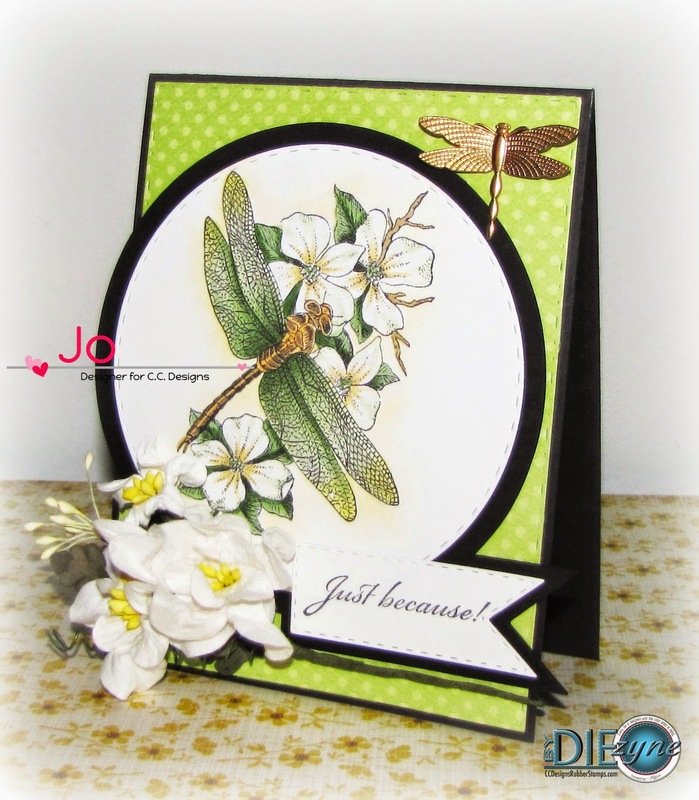 Here's my card using Dragonfly Floral. I've always loved dragonflies, maybe because the wings reminded me of fairies and I always wanted to be one =). I colored it with my Copic Markers and covered the entire image with Wink of Stella in Clear. I masked the whole image and layed some yellow chalk all around for a little glow. 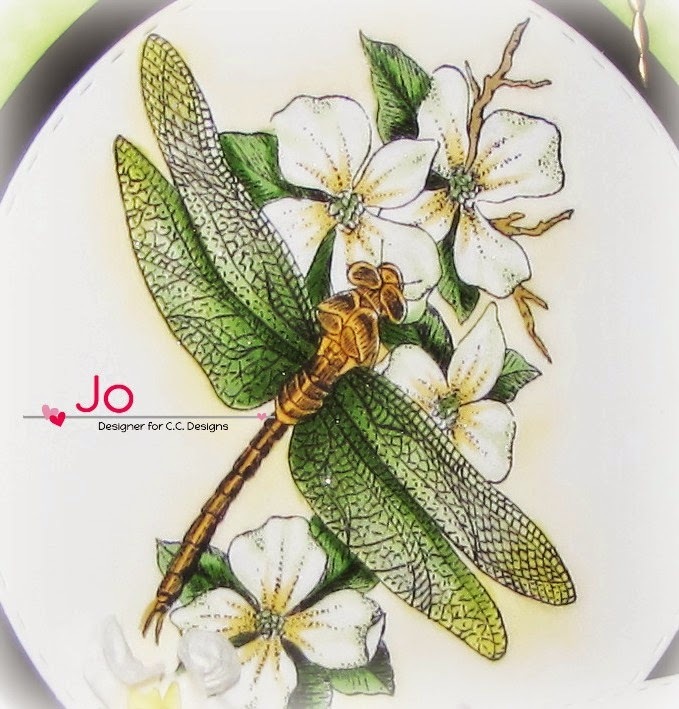 I had the pergfect gold dragonfly embellishment to match, as well as flowers. The image is framed in a circle cut with By DIEzyne Dies - Stitched Circles. The sentiment "Just Because" is from the Simply Sweet Sentiments set and I used the By DIEzyne Dies - Stitched Flags & Stitched Flags Two. I think the black cs made the whole image pop. Make sure you follow the whole hop and comment on the blogs along the way, one random blog has our prize, we will have 1 winner that receives 2 new rubber stamps. Make sure to stop by our Facebook group, we have more giveaways in the group. 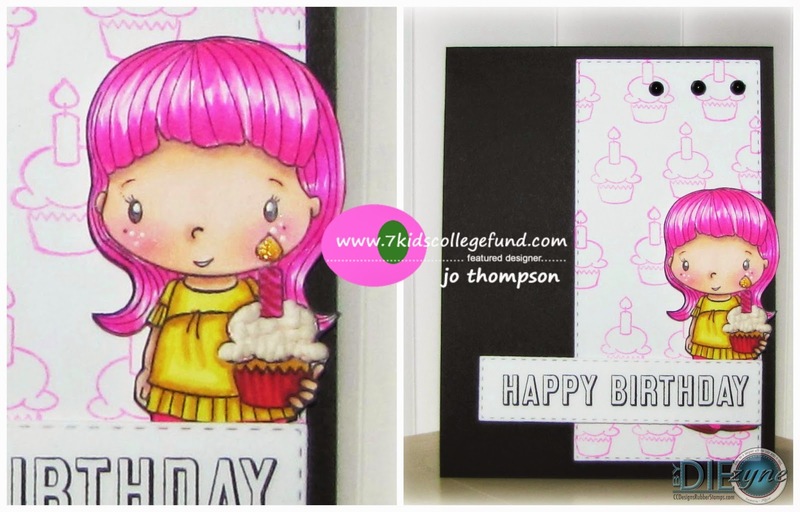 A new challenge is up over at the 7 Kids Challenge Blog, "Anything Goes" is the theme BUT make sure you use a STAMP/IMAGE carried in the 7 Kids College Fund Store in order to qualify. Here is the card I created, using C.C. 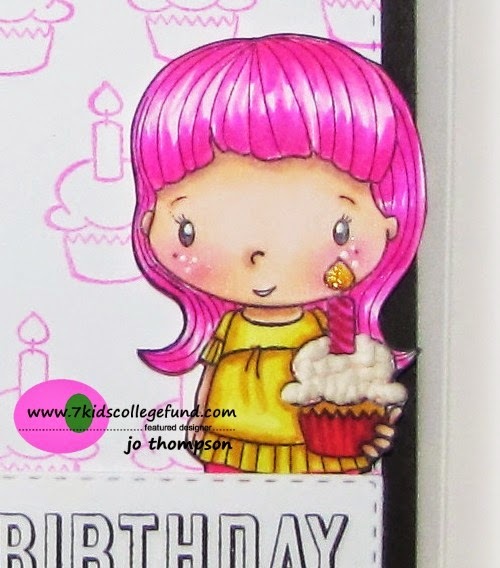 Designs - Birthday Birgitta (#pinkhairdontcare). She is colored with my Copic Markers. The stamp comes with an extra cupcake image. I used Yellow Stickles for the flame and liquid applique for the raised frosting effect. I used the cupcake image to create the background. The base of my card is black cs. 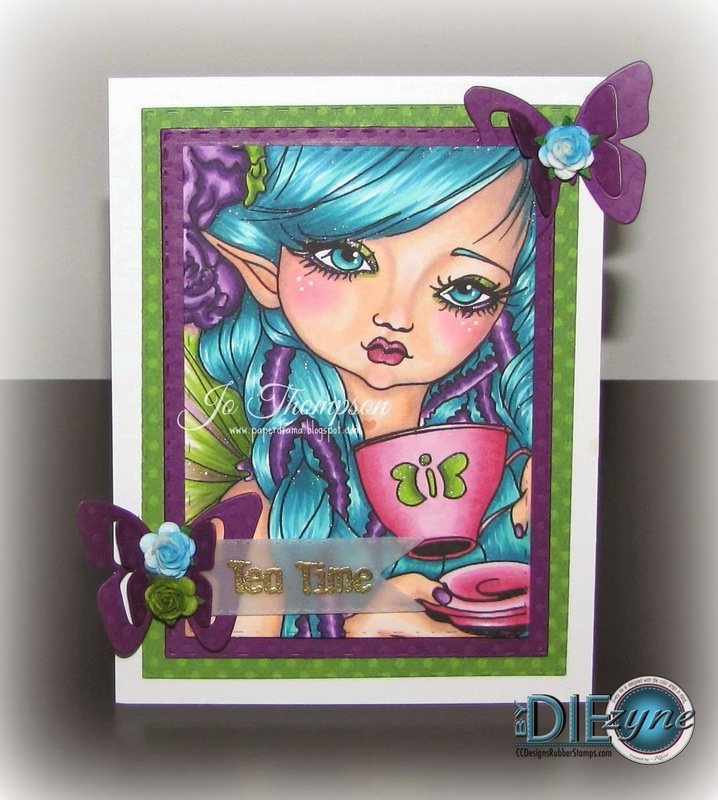 The dies I used are from By DIEzyne Dies - Stitched Strips. The sentiment is from Mama Elephant - Photo Bomb. A simple card but I love the pop of neon pink and the stitching details from the dies. Come play with us over at the 7 Kids Challenge Blog! Thanks for stopping by and enjoy the rest of your week! Hello Saturday! 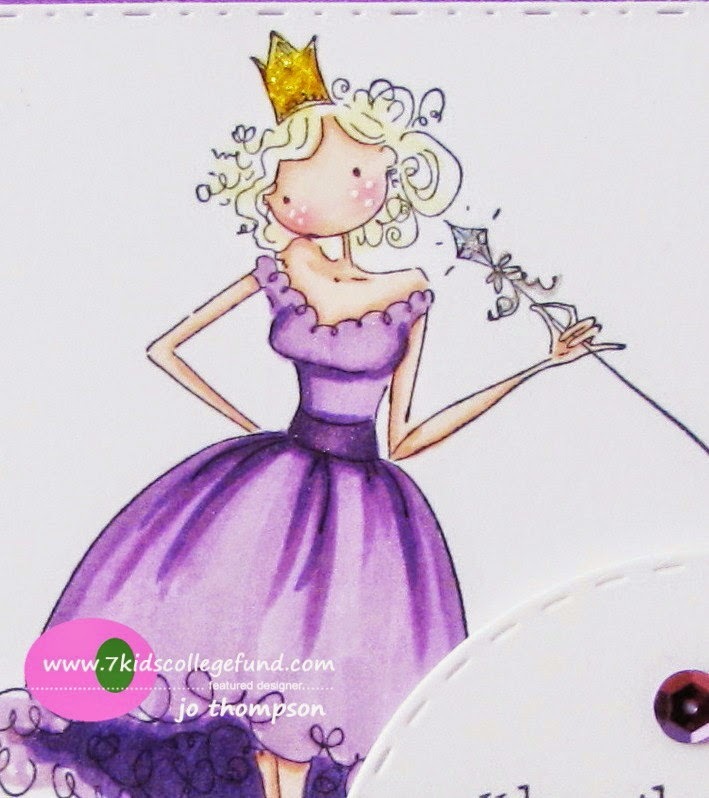 Here with a quick card featuring Stamping Bella - Faith the Fairy. She is colored with Copic Markers and sparkling with Stickles and Wink of Stella in Clear. This image may seem difficult to color with it's stick thin features, but with a steady hand it's possible. Hope your weekend is off to a great start! Come play with us over at er at the 7 Kids Challenge Blog! Thanks for stopping by and Happy Weekend! Good morning! 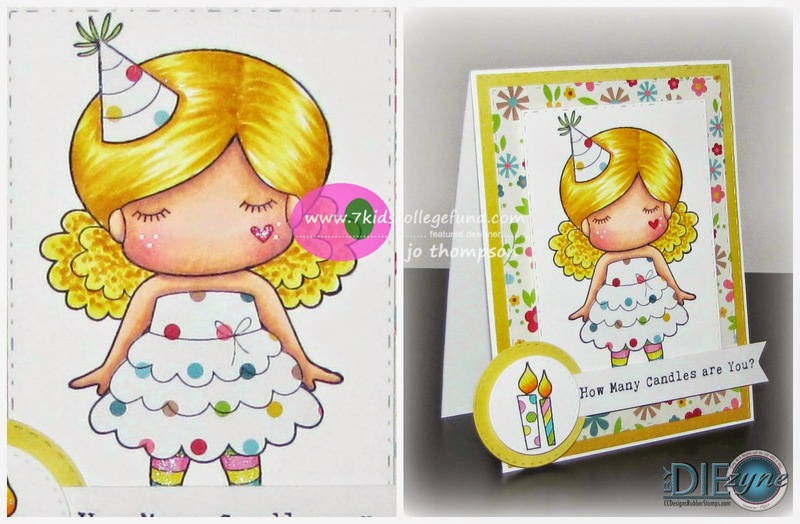 Today I'm sharing a card that I created for the new monthly CAS Sketch Challenge brought to you by C.C. Designs Rubber Stamps and By DIEzyne Dies. 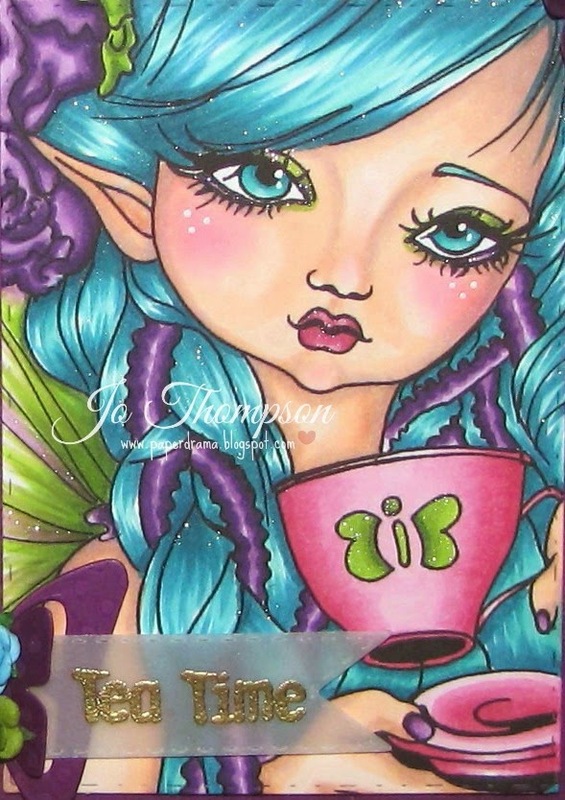 The image is Pollycraft Pixie. She is colored with my Copics. The dies I used from By DIEzyne are Double Circles, Stitched Flags, Stitched Flags Two, Big Stitched & Pierced Rectangles. I layered a cloud embossed vellum piece over the purple cs. I added a little trio of I Am Roses flowers for a little bit of an embellishment. Hi everyone, Happy Thursday! 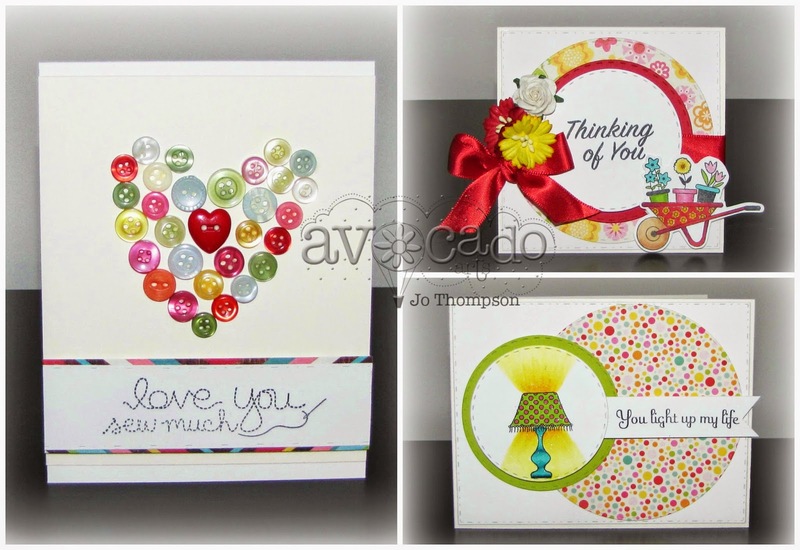 My projects for you today are three cards using the new stamp set "Pear-Fect" from Avocado Arts. This card measures 4"x 4". 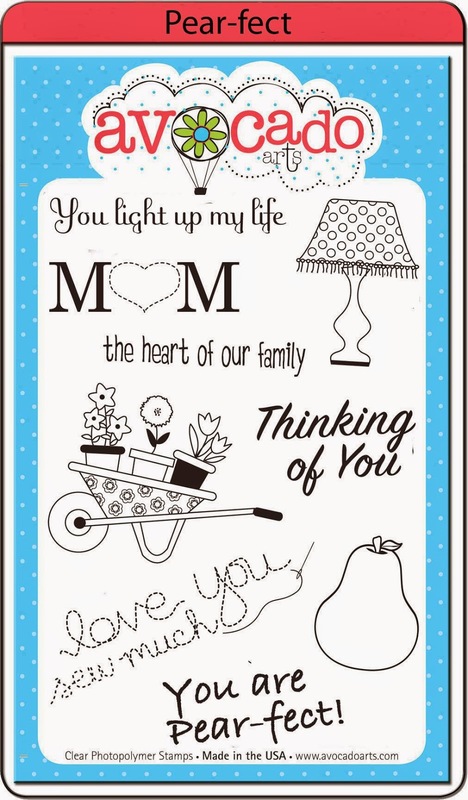 I used the sentiment "Thinking of You" and the image of the flowers in a wheelbarrow. It's colored with Copic markers and I added some shimmer with the Wink of Stella Clear pen. The card base is a cream cs. Just a cute little card to let someone know that they are in your thoughts. This was pretty much a CAS card. 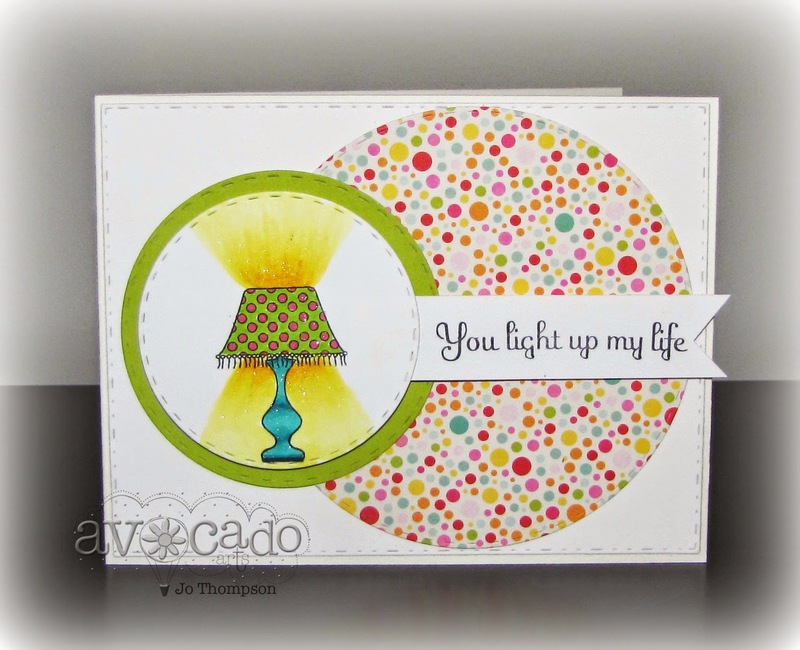 I used the sentiment "You light up my life" and the lamp image from the set. Again it's colored with Copic markers and the Wink of Stella Clear pen. I used some stitched circle/rectangle dies to cut the cs and patern paper. 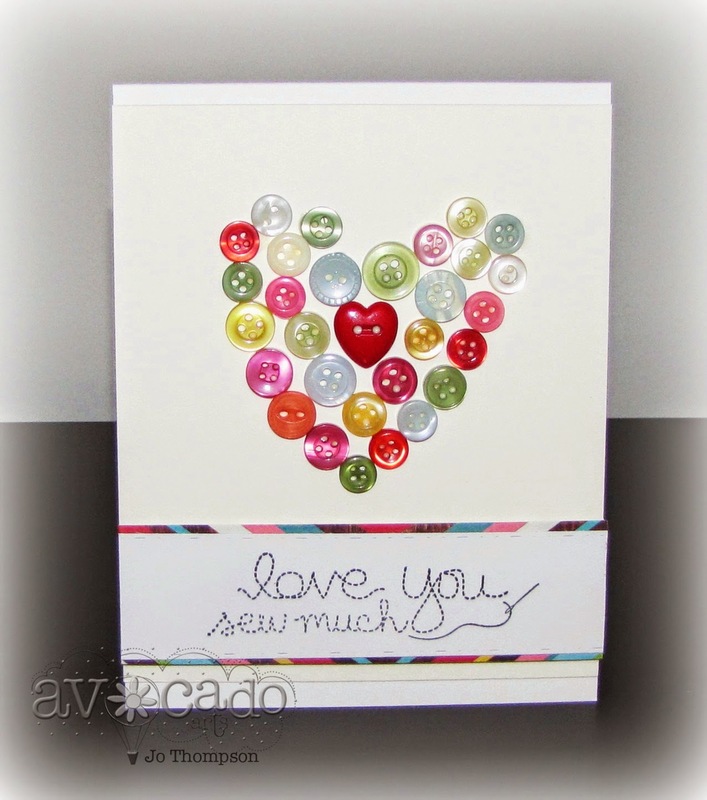 Lastly, I used the sentiment "love you sew much" from the stamp set. I have a plethera of buttons, so I dug in and adhered them to the card forming a heart shape. In case you couldn't tell, LOL, I strategically placed a heart button in the center. So those are my cards for you today. This set is delightful to work with and hope that you enjoy it as well. Thanks for stopping by and make sure to head on over to the Avocado Arts Blog to check out what the other Designers create! How Many Candles are You? Happy Wednesday! Time for a new challenge up over at the 7 Kids Challenge Blog. 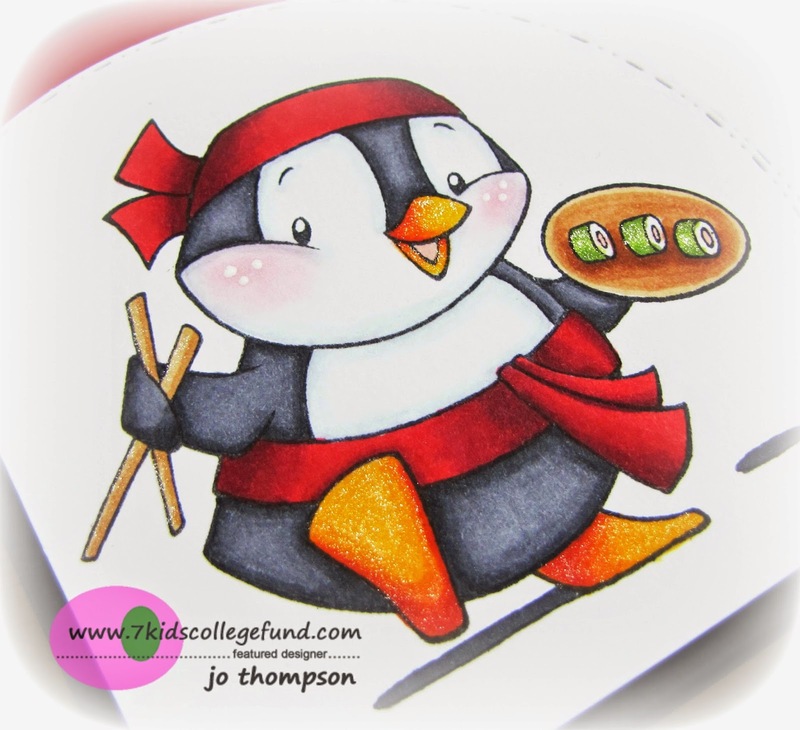 "Anything Goes" (with an Optional Twist "Spring Colors") is the theme for the challenge BUT make sure you use a STAMP/IMAGE carried in the 7 Kids College Fund Store in order to qualify. 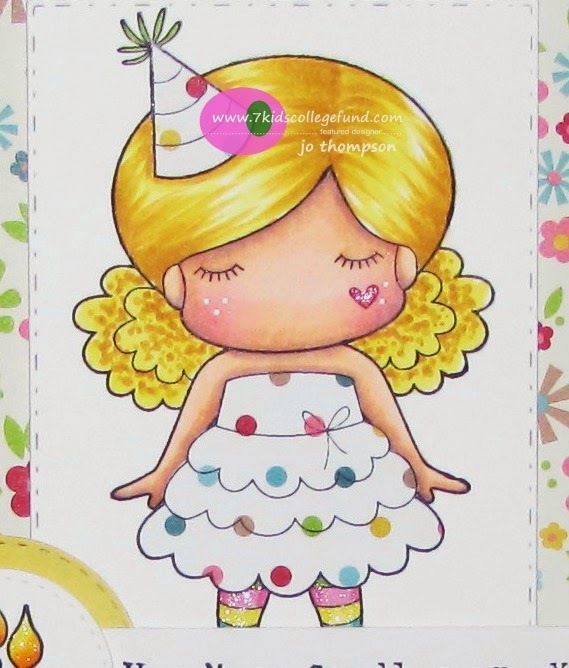 Today I made a card using La-La Land Crafts - Paper Doll Marci Birthday. I chose a bright and a floral pattern for my "Spring Colors" from Simple Stories - Good Day Sunshine 6x6 Paper Pad, and yes I am still trying to use all the papers from this pad. Still tons of patterns to use and still tons of fun. Marci is colored with my Copic Markers and highlighted with my go-to shimmer pen Wink of Stella Clear. Her hat and dress is paper pieced with coordinating pattern papers from the stack. I can't get enough of the By DIEzynes Dies. Here I used the NEW Release Big Stitched/Pierced Rectangles and a previously released Stitched Circles. The stitching and piercings give added detail to a basic shape. Hope you come and play with us over at er at the 7 Kids Challenge Blog! Thanks for stopping by and Happy Hump Day! Good afternoon! 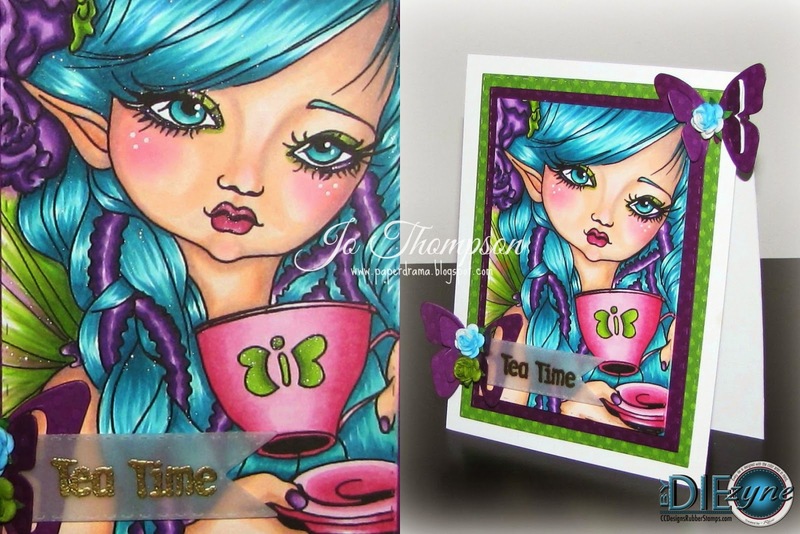 I finally finished coloring this image from Sweet Pea Stamps - Fairy Tea Party. Let me tell you, this had me scared and it took me a long time to complete. It may not look complicated to some, but I had to take breaks just to figure out how I was going to attack it LOL. The sample colored images definitely helped. I love character images, the simple bobble head ones hahaha. So I wanted to challenge myself and colored this image. There's a contest using this image that ends April 8th (sorry for the late post) over on the Facebook Group: Passionate Paper Creations. If you haven't joined, don't wait. There are special discounts and awesome contests/giveaways. Lots of color tutorials and inspiration. Click on the picture below. Here is my finished card. The image is colored with Copic Markers. I kept the overall base simple to compliment the image. 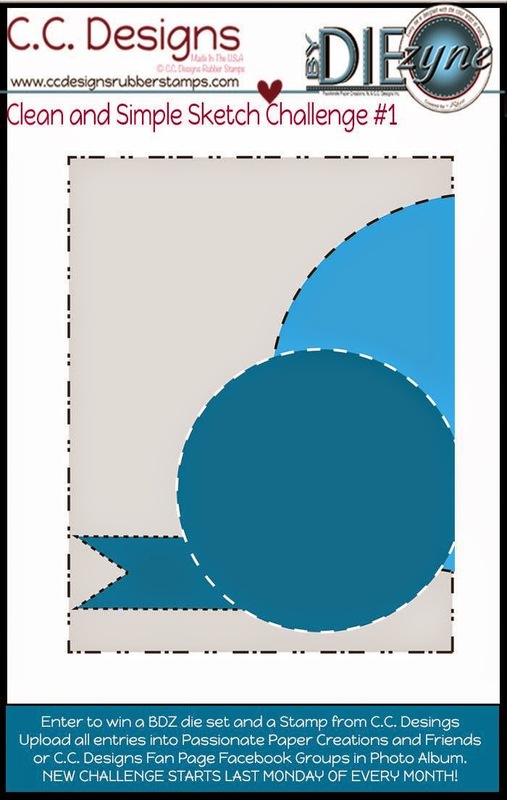 I cut the cardstock and image with By DIEzynes Dies - Big Stitched/Pierced Rectangles. Other By DIEzyne Dies are Dotted Wings and Puffy Things and Stitched Flags Two for the sentiment. I accented her with the Wink of Stella Clear pen. Lastly I added tiny roses on the butterflies. Thank you for taking a look at my card. If ever you are hesitant in choosing intricate images, don't be, you might surprise yourself and realize that it wasn't that difficult. And if all else fails, just paper piece it LOL. Have a great Monday! Good Morning! Time for a new challenge up over at the 7 Kids Challenge Blog. "Anything Goes" is the theme for the challenge BUT make sure you use a STAMP/IMAGE carried in the 7 Kids College Fund Store in order to qualify. How adorable is this penguin? 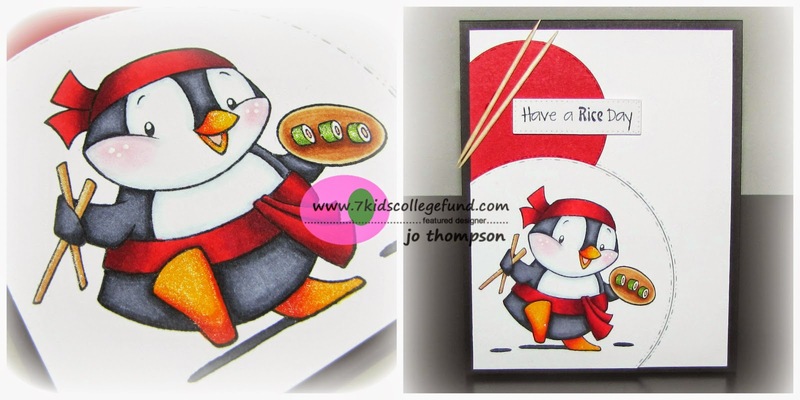 The stamp set I used is from Sugar Pea Designs - Rice Rice Baby. This image has been out but I finally got my hands on it and love it! He is colored with Copics and highlighted with Wink of Stella Clear. I'm using the new release from By DIEzynes Dies - Double Circles. They give that added stitching outside of the circle die. The image is popped up on foam adhesive. I added two toothpicks to mimic chopsticks. 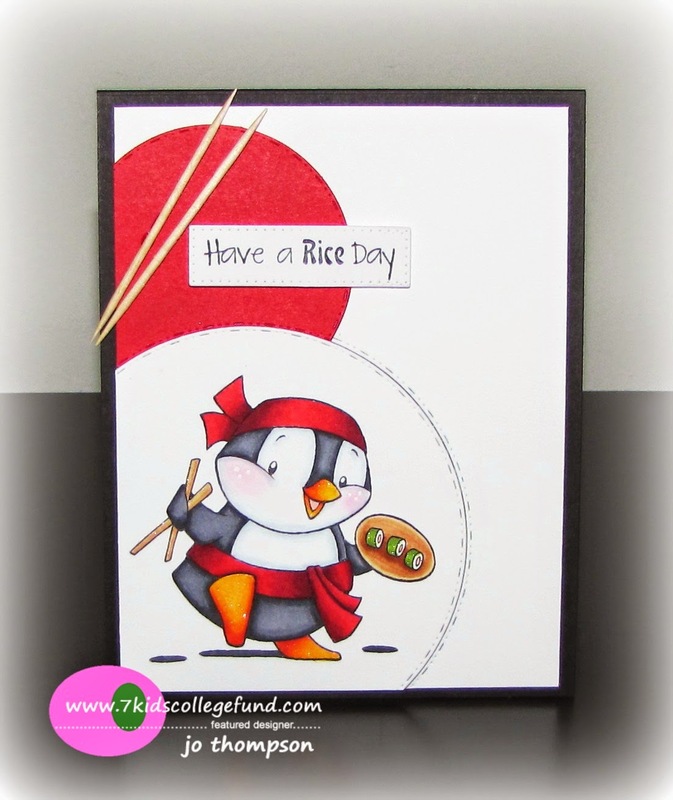 "Have a Rice Day" is one of the many sentiments included in the set. Would this be considered CAS, I think so. So there you have my card. I hope you all have a crafty weekend and an awesome Easter for those who celebrate! Thanks for stopping by! Come join us over at the 7 Kids Challenge Blog! Enter to win! 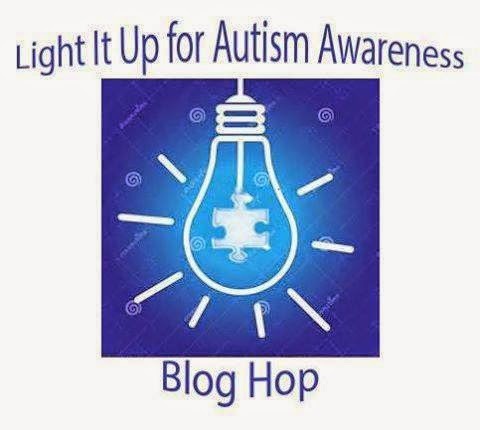 Hello and WELCOME to the Light It Up Blue For Autism Awareness Blog Hop! I'm participating in this blog hop to show support to those who have been affected with Autism. We have so many fantastic sponsors that have shown their support for Autism Awareness and you can see the complete list here: http://lk2thestarz.blogspot.com/…/the-light-it-up-blue-for-…. If you would like a chance to win a prize from one of these fabulous companies leave a comment on this blog, and any of the other blogs participating in the hop! Winners will be chosen at random and will be announced on Monday April 6. Now here is the card I created for today's hop! The theme is to create anything BLUE. Can shaker cards be CAS?? 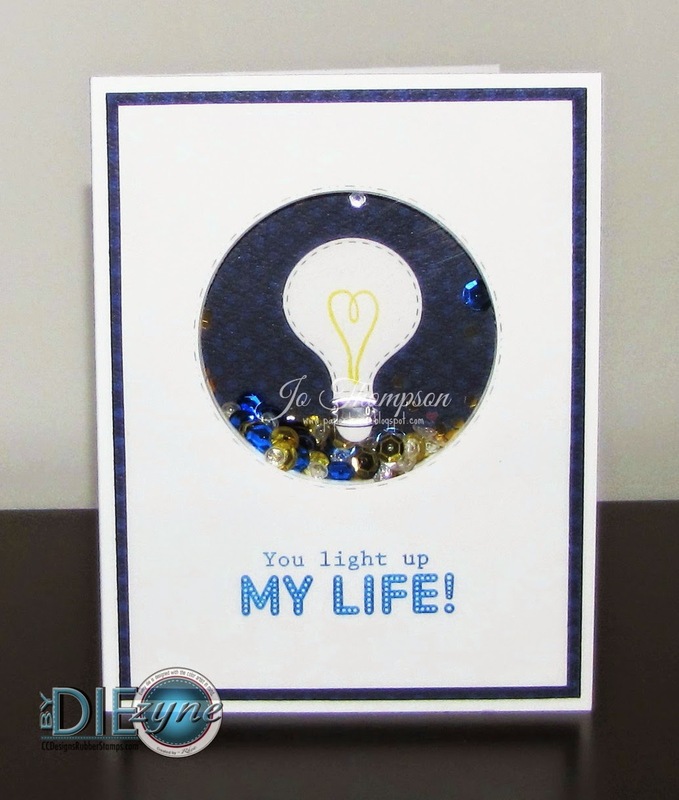 Well this one is =) I used My Creative Time - You're Brilliant stamp/die set. Still trying to use up my sequins. The stitched border around the circle window is from By DIEzyne - Double Circles die. It adds a touch of detail to your standard circle die. I used my new pigment inks from Mama Elephant - Stargazer & Sunshine. This is such a great Blog Hop to bring awareness to Autism. I know that this affects many and I am glad that I can participate with many crafters out there. Thank you so much for stopping by and I hope that you are enjoying all the beautiful creations! Also GOOD LUCK in winning one of the fabulous prizes from the Sponsors! Come join us tomorrow over at the C.C. Designs Blog for the April Release! You won't want to miss all the fabulous projects from the Design Team!